I hope everyone is ready for a great N/A tomorrow! Our new location, Barista Coffee House is an ideal setting for our circle to gather, listen, & chat. This is your opportunity to bring a piece you would like to share, or simply to find out what others are doing. We hope you will help us match October’s success with your attendance in November! CHICAGO, ILLINOIS. 4 November, 2009. The Gothic Funk Nation is accepting submissions for the third issue of its arts journal, The Paramanu Pentaquark. Published biannually online and by CD-ROM, the journal is an eclectic collection of music, painting, photography, poetry, and prose that runs a line from the evocative to the visceral. Selected work exhibits an experimental execution, emotional intensity, and the urgency of communication; this is not a project given to passive pessimism or reluctant daydreams. Issue #2 may be viewed online for free at www.gothicfunk.org. The new issue will be published this upcoming February, and art in any medium may be submitted online at http://www.gothicfunk.org/parapenta/submissions/. Submissions will be considered as Images, Sounds, or Words, and artists will be notified of our decision within two months. In addition to publication, accepted artists will receive a free copy of a limited print CD-ROM of the third issue, and an invitation to present their work at an official launch event hosted in Chicago. The Gothic Funk movement was conceived in November 2004 as a series of parties that framed social intimacy as a point of origin for the creative impulse. Subsequent efforts have included public epistles, artistic projects, two monthly reading series, and more parties. To submit your work, please visit www.gothicfunk.org/parapenta/submissions/. To peruse the second issue of the Paramanu Pentaquark, please visit www.gothicfunk.org/parapenta/02/. For more information on the Gothic Funk Nation, please visit www.gothicfunk.org. This month, we lost a good friend & home to National Address, Mercury Cafe. While it is unlikely to find another venue similar to theirs anytime soon, there are also good reasons to explore new places. On Thursday, October 22 we will be holding National Address at Barista Coffee House, a relatively new shop on Damen, just north of Chicago Ave. They are very excited to have us, & are even willing to stay open late for us (normally open to 8pm on Thursdays.) Please come, & help us show them what we have to offer. It is possible that after 8, we may move to a nearby bar (many good choices,) so please come for the beginning. 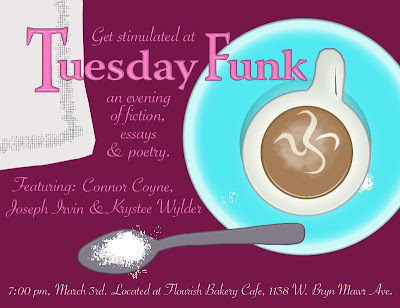 This month, featured presenter Connor Coyne will be reading selections from his novel, Urbantasm. The National Address is the Gothic Funk Nation’s official reading circle, a safe and friendly place to informally workshop works-in-progress. Consisting of readings and round table discussions, the National Address aims to provide a forum for writers of all Gothicly Funky stripes and a voice for the Gothic Funk Nation. Attendance is open and participants are welcome to bring unsolicited material. KRYSTEE WYLDER writes songs for fun and folly, she likes to tell stories about life and also make up nonsensical tapestries of words. She likes cats, coffee and crocheted hats…..she is moving back to chicago after a few months away and is excited to find a new job as a nanny and settle back into her shoes and bicycle in the great big city.